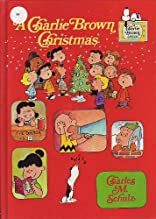 Just like It's the Great Pumpkin, Charlie Brown and A Charlie Brown Valentine, this illustrated read-along seeks to re-create the popular Peanuts TV show of the same name. This edition also includes a four-song sampler CD from jazz-great Vince Guaraldi's brilliant soundtrack. With illustrator Paige Braddock aping Charles Schulz's style, A Charlie Brown Christmas retells the Emmy Award-winning program blow-by-blow (with a few omissions), from the ice-skating opening scene to preparations for the school pageant to Charlie Brown's ill-fated Christmas tree rescue. Braddock almost perfectly mimics the show's cast and backdrops, but just as no one could be fooled by even expert impersonation of a loved one, Peanuts fans might find the niggling differences distracting (whether it's Schroeder's too-wavy hair or Pig Pen's just-too-small head).